A Hot Chocolate Tour of New York. What Are The Top Three? The Accidental Locavore decided to metaphorically take lemons & make lemonade today. Out of the blue, the afternoon was going to be spent meeting people for coffee at three different places, all known for pouring a reasonable (or better) hot chocolate. So, in the interest of sugar and caffeine, I decided to do an informal taste test (just hope my trainer isn’t reading this). First stop: Choco Bolo on the Upper West Side. It’s cute, like an American idea of a French tea shoppe. One of those places with heavily painted and over-painted walls with rickety looking little tables that are impossible to budge. There is the token good-looking waiter/actor who brings the carefully decorated hot chocolate to the table. It’s a big cup, of a pretty straight-forward chocolate, not too much foam and no whipped cream (both pluses in the Locavore’s book). 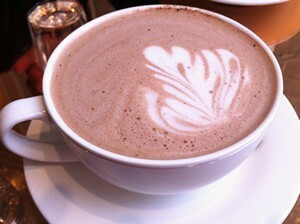 Further downtown is one of the pinnacles of hot chocolate in New York — City Bakery. If their regular blend wasn’t rich enough for you, during the month of February they celebrate with a different flavor of hot chocolate every day. Today it’s Vietnamese Cinnamon. Being a purist, I’m always fine with the normal blend, but while I was waiting for Susan of Naturally Susan’s, a line of natural beauty care, one of the baristas asked me if I wanted a free cup that he couldn’t get anyone to claim. It turned out to be the cinnamon special with a marshmallow. Thick and dense, with the cinnamon giving it a nice warm spice. The marshmallow, although delicious, was definitely overkill! City Bakery’s chocolate always reminds me of the amazing stuff at Angelina’s in Paris. Big difference? At Angelina they give you a big pitcher of whipped cream, so you can thin the chocolate out. The third and thankfully last, was at the coffee bar in Eataly. Now you’re going to be surprised, but yes, Italians (or their NYC counterparts) do make hot chocolate. This cup was the darkest of all three, looking like a thicker version of a very large espresso. The texture was a more like syrup, less like what you would associate with the cocoa of your childhood. It was very good chocolate, dark and dense. My verdict? Of the three, City Bakery was the winner. 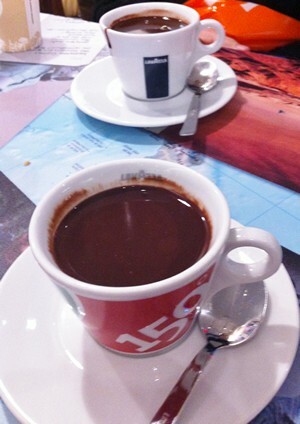 The chocolate is really good, the drink is thick and rich, but you always know you’re drinking hot chocolate. Eataly was a surprising second. Their chocolate was also good, but the texture was just a little slick. Choco Bolo came in third. That cup is closer to the cocoa you had as a kid, probably made with cocoa powder and milk rather than by melting chocolate like the other two. There are other major contenders here in NY, but this is just where I ended up on a particular winter Wednesday. What’s your favorite?